The 2016 ICC World Twenty20 is scheduled between 8 March 2016 and 3 April 2016 in India. 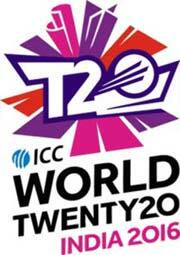 ICC T20 Cricket World Cup 2016 is the 6th edition of ICC T20 Cricket World Cup. ICC T20 Cricket World Cup 2016 participating teams are Bangladesh, Netherlands, Ireland, Oman, Scotland, Zimbabwe, Afghanistan, Hong Kong, Sri Lanka, South Africa, West Indies, England, India, New Zealand, Pakistan, and Australia. The semi-final match of ICC T20 Cricket World Cup 2016 will be played on 30-03-2016 and 31-03-2016. The final match of ICC T20 Cricket World Cup 2016 will be on 03-04-2016 at Eden Gardens, Kolkata.